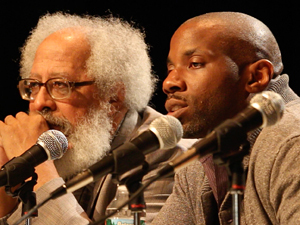 UMass Amherst professor John H. Bracey & Trevor Baldwin, James Baldwin’s nephew at Amherst Regional High School. The award-winning re-mastered documentary film James Baldwin: The Price of the Ticket garnered two grants, a wildly successful Public Squared grant and a follow up grant to extend that project into classroom ready materials on James Baldwin. Baldwin, prominent social critic and writer, offered an authentic voice on the black experience and freedom struggle in America of the 20th century and its enduring legacy. In 2014, the 90th Anniversary of James Baldwin’s birth coincided with a period of escalating violence in black communities and several Civil Rights Movement milestones — the 50th anniversary of the signing of the Voting Rights Act of 1965, the 50th anniversary of Malcolm X’s assassination, and the 60th anniversary of Emmett Till’s murder. In commemoration, the award-winning documentary film classic, James Baldwin: The Price of Ticket (1989) was used to spur conversation on Baldwin’s central message and vision: human affiliation, hope and the power of love to inspire civic engagement. Over two thousand people participated in Conversations with Jimmy, co-hosted by the Maysles Institute in partnership with local community groups, in six regions across Massachusetts. A wide spectrum of community residents were engaged in thoughtful discourse on issues of race, ethnic diversity, racism and the meaning of human rights and affiliation within the context of related local issues. Mass Humanities funding became a pilot project for a successful initiative that is now both national and international, including a European tour in 2017. A second grant about the life and work of James Baldwin was awarded for the creation of classroom multimedia study guides and lesson plans. This grant project should be finished soon. What Does Women’s History Month Mean to You?